Pause for Animals - Paintings by Mary Anne Nagy. The Glass And Decor Studio Tour features 4 studios. My art is part studio #4 the Blowing Sands portion of the Tour. Please stop by to see my work! 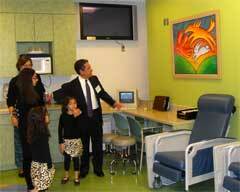 Dr Taub and family viewing my artwork at Children's hospital of Michigan. I'm very excited that twenty one 30" x 40" framed Pause for Animals prints have been installed at Children's Hospital of Michigan in their new hematology/oncology unit! This is in addition to the twenty eight large framed giclee prints from my series, that are already on permanent display in the hospital! See my Featured Artist Profile interview and images on the Arts Business Institute blog! My art enlivens the walls of HopeCentral , a new pediatric and behavioral health primary care practice located in Southeast Seattle's Rainier Valley! Rainier Valley is a cultural crossroads with over sixty languages spoken by families from all over the world. It really makes me happy to think about kids from so many different counties and backgrounds, getting to be greeted by my colorful animals. Patients in the recovery room at Huron Valley-Sinai Hospital wake up to my large whimsical animal prints brightening the walls. A permanent display of my large framed giclee animal prints is installed at Safe & Sound Child Advocacy Center in Midland Michigan. The Center provides a refuge and a voice for abused and neglected children. My large framed prints now brightening up the walls of the office headquarters of The Bottomless Toy Chest, a new nonprofit organization devoted to delivering art projects, crafts and interactive toys to children hospitalized with cancer. My painting ‘Free Day’ is hanging by the cafeteria at Swedish/Edmonds and is on long term loan. According to David Jaffe, interim chief administrative officer at Swedish/Edmonds, "Art has long been recognized for its role in the healing process." 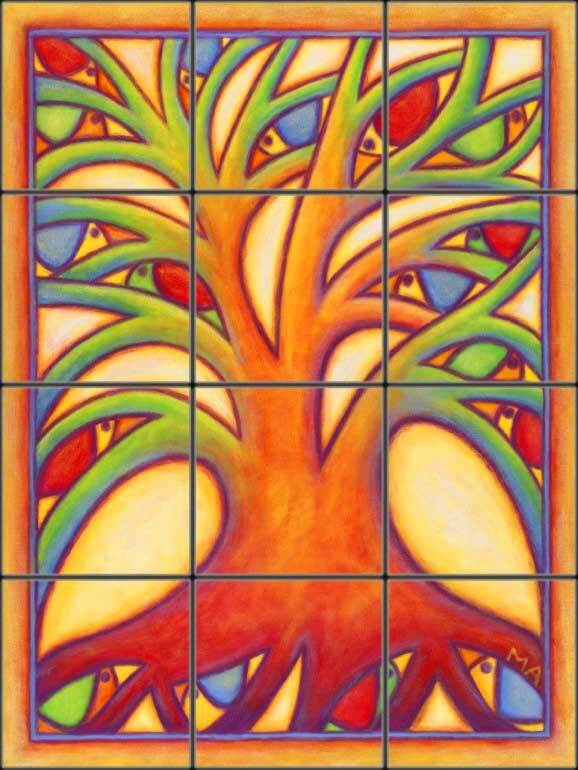 Pacifica creates tile art and tile murals for both commercial and residential spaces, and has international distribution. Giclee prints, prints, cards and paintings. All works copyright© Mary Anne Nagy 2003. No image may be reproduced without prior written consent.